decision - making processes of projects and policies. Environmental policy analysis and policy instruments. The course is designed for staff working in all social and economic development sectors with implications on the environment such as Manufacturing & Processing Industries, Mining Industries, Energy Utilities, Agriculture-based Industries, Chambers of Commerce, Investment Promotion Agencies, Government Ministries, Consultancy firms and organisations wishing to develop capacity in Environmental management. Skills for preparing environmental audit reports and communication. Audit report writing and communication. 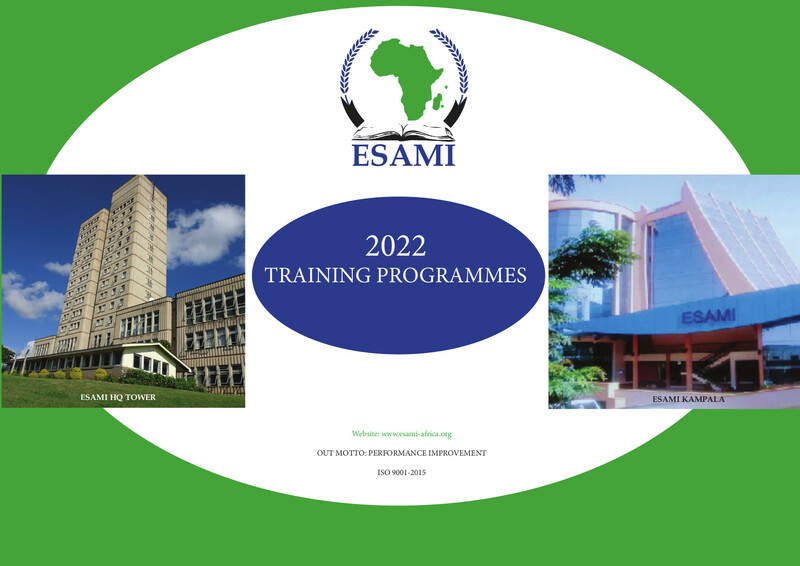 The programme is suitable for Financial and Systems Auditors (internal and external), Government business and product Inspectors, Accountants, Financial Managers, Human Resources Managers and Business Administrators, Supplies and Procurement Managers, Production Managers and Supervisors, Quality Control Managers and Supervisors, Maintenance Managers, Health and Safety Managers, Environmental Managers and Consultants. The introduction of Strategic Environmental Assessment (SEA) extends the aims and principles of environmental impact assessment (EIA) upstream to the higher, pre-project level of decision-making. It affords an important new means of analyzing and addressing the environmental effects of development policies, strategies, plans, programmes and other proposed strategic actions. All those involved in formulating and executing these actions and those in EIA practice should have an understanding of SEA – what it is, why it has emerged and how it contributes to informed decision-making in support of environmental protection and sustainable development. This programme is suitable for senior officers from Government Ministries/Departments (such as Environment, Infrastructure, Natural Resources, Mining, Agriculture, Water, Energy, Defense, etc. ), Government Agencies (such as Environmental Protection Agencies and Sector Regulatory Agencies), and NGOs involved in formulation and management of economy-wide policies, strategies, plans, programmes, legislation and those that are in Environmental Impact Assessment (EIA) practice. The programme is suitable for officers responsible for CSR, Officers responsible for; environmental issues, quality management issues, and occupational health & safety issues in private sector companies and organizations, Government Parastatals and Agencies, Regulatory Authorities, and NGOs. The programme is also appropriate for Officers responsible for communication, public relations and human resources management. The programme is designed to provide participants with the Quality Management principles, techniques, tools and skills for on-the-job application useful in a wide range of businesses and organizations service, manufacturing, government, education, healthcare, etc. This programme should be attended by Middle to Senior Officers responsible for quality planning/control/assurance, marketing, production, environment/health/safety, from Manufacturing and Service (Private Sector) Industries, Government Ministries and Parastatals, Executive and Regulatory Agencies, Export oriented Farmer/Agriculture Organizations, Cooperatives and Traders, and NGOs. The programme is particularly appropriate for organizations and companies that are planning to implement quality management and/or quality management systems and are not sure how to go about it. Organizations and companies already implementing quality management and quality management systems can also attend as a refresher course. Climate change occurrence on earth is no longer an issue for debate. The impacts of climate change are already being felt around the world, more so in the least developing countries of Africa, which are more vulnerable than those on other continents. Climate change leads to changes in geophysical, biological and socio-economic systems. There is an urgent need to have governments, the private sector and the NGO sector to come up with effective strategies for assessing and managing climate change related risk in order to mitigate it and achieve sustainable development goals. Describe institutional issues in climate change risk management. Institutional issues in climate change risk assessment. This programme can be attended by Policy Makers, Planners, and Analysts from Government Ministries, Departments, and Agencies responsible for Disaster Preparedness, Finance, Economic Planning, Environment, Energy, Agriculture, Mining, Natural Resources, Infrastructure, etc. Senior Managers from the Private and NGO sectors interested in climate change risk management can also attend the programme. A clear understanding of key environmental management strategies for clean and green production and consumption in all social and economic development activities. A clear understanding of environmental management systems. Knowledge and skills of integrating environmental concerns in decision - making processes of projects and policies. The course is designed for staff working in all social and economic development sectors with implications on the environment such as manufacturing & processing industries, mining industries, energy utilities, agriculture-based industries, chambers of commerce, investment promotion agencies, government ministries, consultancy firms and organisation wishing to develop capacity in environmental management. To close negotiations with win-win agreements that last. This programme is intended for Middle-to-Senior Officers who do not yet have knowledge and experience in managing or participating in environmental negotiations from Government Ministries, Departments, Agencies & Regulatory Authorities responsible for Finance, Economic Planning, Environment, Natural Resources, Energy, Agriculture, Mining, Water, Land, Forestry, Wildlife, Local Government, Health, Labour, Infrastructure such as Roads, Railways, Airports, Harbors, etc. Participants from NGOs and Private Sector firms interested in environmental negotiations may also attend the programme. The implementation of Environmental Impact Assessment (EIA) of projects has now become a legal requirement in every country in Africa. Development projects initiated by governments and investment projects initiated by the private sector have to undergo a comprehensive EIA if they are deemed to be potentially damaging to the environment. Environmental Impact Assessments guide project proponents on the selection of appropriate mitigation measures that can be integrated in project design in order to improve the environment. Currently, many EIA studies are not done properly due to lack of the required skills in Africa. As a consequence, decision makers often have no clear idea as to what type of information is needed to make rational and timely decisions when appraising projects. Furthermore, too much emphasis is often given to data collection, and not enough on their analysis, interpretation, and their overall environmental implications. Another major problem stems from the fact that monitoring and evaluation of the actual environmental impacts of projects are mostly inconspicuous. The absence of proper monitoring and evaluation is now a major handicap for rational environmental management. issues in their development plans. This training has been designed to provide practical help to those involved in planning and development of new and existing projects and have to carry out environmental impact assessment (EIA). It is also suitable for decision makers who appraise, evaluate and finance projects. The workshop will benefit staff of private, public and NGO sector organizations. The purpose of this programme is to provide an overview of environmental issues in the oil and gas exploration and production industry, and best approaches to achieving high environmental performance in the industry in Africa. This programme targets Planners, Project Managers, Project Engineers, Environmentalists from central and local government ministries and departments, oil and gas industries, regulatory agencies, banking industry, consulting and research sector, and the NGO sector. Carbon projects are developed for reasons of voluntary environmental stewardship, as well as legal compliance under a Greenhouse Gas (GHG) carbon emissions trading program. Voluntary carbon emissions reducers may wish to monetize reductions in their carbon footprint by trading the reductions in exchange for monetary compensation. Such carbon finance can significantly contribute to poverty reduction and sustainable development for communities implementing carbon projects in Africa. The transfer of environmental stewardship rights would then allow another entity to make an environmental stewardship claim. There are several voluntary reduction standards that projects can use as guides for development. Participants will learn how to develop and implement carbon projects relevant to their sectors, e.g. agriculture, forestry, energy, and municipal waste. Tracking adaptation measurement of project activities. Case study- Kenya SALM carbon project. climate change are already being felt around the world, more so in the least developing countries of Africa, which are more vulnerable than those on other continents. Climate change leads to changes in geophysical, biological and socio-economic systems. There is an urgent need to have governments, the private sector and the NGO sector to come up with effective strategies for assessing and managing climate change related risk in order to mitigate it and achieve sustainable development goals. agencies responsible for Disaster Preparedness, Finance, Economic Planning, Environment, Energy, Agriculture, Mining, Natural Resources, Infrastructure, etc. Senior managers from the private and NGO sectors interested in climate change risk management can also attend. people all around the world today. Economic growth activities and business activities are generating significant environmental impacts, ranging from the destruction of precious biological diversity, unsustainable exploitation of natural resources, air-pollution to human health deterioration. Environmental auditing provides an opportunity to determine the source of environmental impacts and to evaluate possible corrective action as part of regulatory environmental compliance requirements or as part of a broader environmental management plan in an organization or project. Participants will learn how to plan, implement and report an environmental audit programme. and NGO sectors. Environmental officers and inspectors are also eligible to attend the course. New public & private sector investment projects and rehabilitation projects may impact on the environment and society positively and as well as negatively. Negative environmental and social impacts can be identified early in the project planning and design stages by conducting Environmental (& Social) Impact Assessment (EIA/ESIA). The lack of such undertaking could lead to a large number of environmental and social costs and impacts. The environmental and social assessment process provides proponents and decision makers, as well as members of the public, with an understanding of the potential environmental effects of proposed action, so as to avoid or minimize adverse effects wherever possible bearing in mind the costs and benefits of using the environmental resource in the particular project. EIA/ESIA is an important tool for making the right decisions and for designing better and more sustainable projects, plans and policies. Participants will use EIA/ESIA to take into consideration the economic, social and environmental impacts of projects and decide on appropriate mitigation actions. Officials involved in planning and designing new projects including rehabilitation and redesigning existing projects and have to carry out environmental and social impact assessments. Decision makers who appraise, review, and finance proposed new projects. These include officials from Environmental Protection Agencies, Ministries of Environment; planners, project managers and environmental officers from all Government Ministries, Industries, and NGOs, in sectors such as Oil and Gas, Electricity, Mining, Agriculture, Works, Roads, Telecommunication, Water, Transport, and Local Government. Officials responsible for environmental issues in Government Regulatory Agencies can also attend. Mitigation and impact management (Environmental management plans (EMP). The boom in oil and gas exploration and prospecting on the African continent is increasing by the day. Exploration and prospecting activities are going on in almost all countries from West to East and Southern Africa. The oil and gas sector will continue to grow in Africa in the foreseeable future and will contribute significantly to the GDP of the African economy. The oil and gas exploration, prospecting and production activities have always been a major source of negative environmental effects. Oil spills, damaged land, accidents and fires, displacement of com- munities, air and water pollution has been recorded in various places. The oil and gas industry has worked for a long time to meet the challenge of providing environmental protection. It is incumbent upon Africa to learn from the lessons of other continents in dealing with environmental issues in the oil and gas sector. Planners, project managers, project engineers, environmentalists from central and local government ministries and departments, oil and gas industries, regulatory agencies, banking industry, consulting and research sector and the NGO sector. Environmental management in the oil and gas industry. Development activities such as business, industry, and large development projects play a crucial role in the social and economic development of a country. These activities, however, can also be a major source of local, national and trans-boundary environmental damage with serious effects on the physical environment, biodiversity, climate and human health. The traditional approach to addressing environmental issues by developers has been reactive, ad-hoc and end-of-pipe manner. It is now well known that this approach is often times very costly to the local, national or regional economies. Uncontrolled economic development that depletes natural capital and generates serious pollution is not sustainable for either the present or future generations. Integrating environmental management into the design and implementation of development interventions can go a long way to mitigate the negative environmental effects and to enhance the environmental and socio-economic benefits. Officials working in social and economic development sectors with implications on the environment such as agriculture, transport, energy, water, mining, communication, health, trade and industry, local government, and tourism. The course is also relevant for officials from regulatory authorities in the above sectors and environment. Implement ISO-based environmental management systems in organizations and projects. Environmental management systems (ISO 14001). Public spending, which represents between 15 per cent and 30 per cent of GDP in a given country, can help drive markets towards innovation and sustainability, thereby enabling green growth and the transition to a Green Economy. Green Public Procurement (GPP) is one of the means to achieve sustainability. It has thus become increasingly clear among policy makers that public procurement can play a strategic role and that, it can specifically contribute to achieving sustainable development goals. Through GPP, governments can lead by example and deliver key policy objectives in the environmental, social and economic fields through reduction in greenhouse gas emissions, improved energy and water efficiency and recycling. Associated positive social benefits include poverty reduction, improved equity and respect for core labor standards. And from an economic perspective, GPP can generate income, reduce costs and support the transfer of skills and technology. Participants will examine practical environmental practices and tools for Greening Public Procurement. Middle and senior-level officials responsible for procurement and for project management, members of central and ministerial tender boards, finance, auditors, procurement inspectors, environmental managers, and public administrators. Effective environmental negotiation requires effective communication and trust building. Thus, time is spent on tools to improve communication and build relationships. This course emphasizes the use of interest-based negotiation approaches to build trust, persuade, and create lasting solutions. Participants will learn to recognize commonly encountered unethical tactics and shown productive responses. Examples of both successful and unsuccessful negotiations will be examined. Middle-to-senior officers who need to enhance their knowledge and experience in managing or participating in environmental negotiations from Government Ministries, Departments, Agencies & Regulatory Authorities responsible for Finance, Economic Planning, Environment, Natural Resources, Energy, Agriculture, Mining, Water, Land, Forestry, Wildlife, Local Government, Health, Labour, Infrastructure such as Roads, Railways, Airports, Harbours, etc. Participants from NGOs and Private Sector firms interested in environmental negotiations are also eligible to attend the course. Close negotiations with win-win agreements that last. Implementation, monitoring and compliance of MEAs. The introduction of strategic environmental assessment (SEA) extends the aims and principles of environmental impact assessment (EIA) upstream to the higher, pre-project level of decision-making. It affords an important new means of analyzing and addressing the environmental effects of policies, plans, programmes and other proposed strategic actions such as parliamentary bills. All those involved in EIA practice should have an understanding of SEA what it is, why it has emerged and how it contributes to informed decision-making in support of environmental protection and sustainable development. Officials involved in the formulation, planning and implementation of economy-wide policies, strategies, programmes, plans, and legislation. These include officials working in Government Ministries/Departments such as Environment, Natural resources, Economic Planing, Tourism, Mining, Energy, Infrastructure, Roads, Agriculture, Water, Defense, and officials working in Government parastatals and regulatory agencies. Officials in the environmental impact assessment (EIA) practice are also eligible to attend the course. Track adaptation measurement of project activities. Officials planning to design, implement and manage carbon projects in agriculture, forestry, energy and municipal waste sectors. These include officials from Government Ministries/Departments of agriculture, land management, forestry, finance, energy, construction, transport, mining, and Local Government authorities. Officials from the business community and NGOs working in the above sectors and interested in carbon projects are also eligible to attend the course. Policy Makers, Planners, and Analysts from government ministries, departments, and agencies responsible for Disaster Preparedness, Finance, Economic Planning, Environment, Energy, Agriculture, Mining, Natural Resources, & Infrastructure. Senior Managers from the private and NGO sectors interested in climate change risk management can also attend the course. Global warming and climate change impacts are taking their toll on the environment and on people all around the world today. Economic growth activities and business activities are generating significant environmental impacts, ranging from the destruction of precious biological diversity, unsustainable exploitation of natural resources, air pollution to human health deterioration. Environmental auditing provides an opportunity to determine the source of environmental impacts and to evaluate possible corrective action as part of regulatory environmental compliance requirements or as part of a broader environmental management plan in an organization or project. Officials responsible for carrying out environmental audits, internal and external financial, technical and systems audits, and officials implementing environmental management plans, systems, policies, and programmes within organizations and projects in the public, private, and NGO sectors. Environmental officers and inspectors are also eligible to attend the course. New public & private sector investment projects and rehabilitation projects may impact on the environment and society positively and as well as negatively. Negative environmental and social impacts can be identified early in the project planning and design stages by conducting Environmental (& Social) Impact Assessment (EIA/ESIA). The lack of such undertaking could lead to a large number of environmental and social costs and impacts. The environmental and social assessment process provides proponents and decision makers, as well as members of the public, with an understanding of the potential environmental effects of proposed action, so as to avoid or minimize adverse effects wherever possible bearing in mind the costs and benefits of using the environmental resource in the particular project. EIA/ESIA is an important tool for making the right decisions and for designing better and more sustainable projects, plans and policies. Participants will use EIA/ESIA to take into consideration the economic, social and environmental impacts of projects and decide on appropriate mitigation actions. Develop and implement an environmental management plan (EMP) complete with a mitigation and monitoring plan. Officials involved in planning, designing and managing new projects including rehabilitation and redesigning existing projects and have to provide oversight or carry out environmental and social impact assessments from Central and Local Government institutions. Decision makers who appraise, review, and finance proposed new projects from private sector companies and NGOs are also eligible to attend. Mitigation and impact management - Environmental management plans (EMP). The oil and gas exploration, prospecting and production activities have always been a major source of negative environmental effects. Oil spills, damaged land, accidents and fires, displacement of communities, air and water pollution have been recorded in various places. The oil and gas industry has worked for a long time to meet the challenge of providing environmental protection. It is incumbent upon Africa to learn from the lessons of other continents in dealing with environmental issues in the oil and gas sector. Development activities such as business, industry, and large development projects play a crucial role in the social and economic development of a country. These activities, however, can also be a major source of local, national and trans-boundary environmental damage with serious effects on the physical environment, biodiversity, climate and human health. The traditional approach to addressing environmental issues by developers has been reactive, ad-hoc and end-of-pipe manner. It is now well known that this approach is often times very costly to the local, national or regional economies. Uncontrolled economic development that depletes natural capital and generates serious pollution is not sustainable for either the present or future generations. Integrating environmental management into the design and implementation of development interventions can go a long way to mitigate the negative environmental effects and to enhance the environmental and socio-economic benefits. Officials working in all social and economic development sectors with implications on the environment such as agriculture, transport, energy, water, mining, communication, health, trade and industry, local government, and tourism. The course is also relevant for officials from regulatory authorities in the above sectors and environment. Public spending, which represents between 15 per cent and 30 per cent of GDP in a given country, can help drive markets towards innovation and sustainability, thereby enabling green growth and the transition to a Green Economy. Green Public Procurement (GPP) is one of the means to achieve sustainability. It has thus become increasingly clear among policy makers that public procurement can play a strategic role, and that, it can specifically contribute to achieving sustainable development goals. Through GPP, governments can lead by example and deliver key policy objectives in the environmental, social and economic fields through reduction in greenhouse gas emissions, improved energy and water efficiency and recycling. Associated positive social benefits include poverty reduction, improved equity and respect for core labor standards. And from an economic perspective, GPP can generate income, reduce costs and support the transfer of skills and technology. Participants will examine practical environmental practices and tools for Greening Public Procurement. Commitments made by suppliers or service. Middle and senior-level officials responsible for procurement and for project management, members of central and ministerial tender boards, finance, auditors, procurement inspectors, environmental managers, and public administrators. Officers who have attended past ESAMI procurement courses are strongly encouraged to attend. Effective environmental negotiation requires effective communication and trust building. Thus, time is spent on tools to improve communication and build relationships. This course emphasizes the use of interest-based negotiation approaches to build trust, persuade, and create lasting solutions. Participants will learn to recognize commonly encountered unethical tactics and shown productive responses. Examples of both successful and unsuccessful negotiations will be examined. Middle-to-senior officers who do not yet have knowledge and experience in managing or participating in environmental negotiations from Central and Local Government Ministries, Departments, Agencies & Regulatory Authorities responsible. Participants from NGOs and Private Sector firms interested in environmental negotiations are also eligible to attend the course. Central & Local Government Officials involved in the formulation, planning and implementation of economy-wide policies, strategies, programmes, plans, and legislation. These include officials working in Government Ministries/Departments such as Environment, Natural resources, Economic Planning, Tourism, Mining, Energy, Infrastructure, Roads, Agriculture, Water, Defence, Local Government, parastatals and regulatory agencies. Officials in the environmental impact assessment (EIA) practice are eligible to attend the course. SEA implementation, reporting, review and monitoring. Policy makers, planners, and analysts from government ministries, departments, and agencies responsible for Disaster Preparedness, Finance, Economic Planning, Environment, Energy, Agriculture, Mining, Natural Resources, Infrastructure, etc. Senior managers from the private and NGO sectors interested in climate change risk management can also attend the course. • Tracking adaptation measurement of project activities. • Case study- Kenya SALM carbon project. • Gain knowledge in organizational organizational governance, human rights, labor practices, the environment, fair operating practices, consumer issues, and community involvement and development. • Prepare social performance reports. Officers responsible for corporate social responsibility, Environment, corporate communication, public relations, marketing, Human Resource management, quality management, occupational health & safety. These include officials working in government ministries and departments, Private sector companies in Manufacturing, Service industries such as banking and insurance, infrastructure such as telecommunications and construction, mining, energy, water and agriculture industries. parastatals, & agencies. Officers from Ministries/ Departments and parastatals (such as those in environment, labor, infrastructure, natural resources, mining, agriculture water, energy, local Government and Defense), Government agencies (Such as environmental protection agencies and sector regulatory agencies) local and international NGOs are encouraged to attend the course. The purpose of the programme is to provide participants with an in-depth understanding of the environmental and societal risks associated with exploration, implementation, operation and closure of a mining or oil & gas projects. The project delivery model will identify the best industry standards and practices for appraising environmental and social matters that need to be managed throughout the life cycle of a project. This model is paramount since mining and oil & gas project lifecycles entail significant environmental and societal risk that cannot easily be reversed. A summary of the most significant key environmental and societal risks and some of the critical public concerns will be presented. Upon completion of the course, participants will be able to understand the global prevailing environmental and societal context for the mining and oil & gas sectors. This context includes a review of the legal requirements and standards that impact local environs and an understanding of the techniques for environmental, social and economic impact assessments. The necessary mitigation including appropriate control measures, stakeholder’s mapping, public consultation and disclosure plans. To ensure compliance with the project delivery model the key performance indicators and the monitoring and environmental management plans will be discussed. The final step in the environmental and societal delivery model will be the development of a Reclamation Plan for Closure and Post-Closure. • Identify critical environmental and social issues to be monitored in the course of exploration and production to closure of hydrocarbon projects. • Carry out environmental risks and impact assessment for new and ongoing projects. • Prepare Environmental Management Plan necessary to contain footprint of oil and gas projects. • Monitor and report on quality of ground, water and air impacted by the project. The course will be beneficial to environmental regulators, managers, operations staff, financial analysts, environmental engineers, auditors, project managers and environmental NGOs. Global warming and climate change impacts are taking their toll on the environment and on people all around the world today. Economic growth activities and business activities are generating significant environmental impacts, ranging from the destruction of precious biological diversity, unsustainable exploitation of natural resources, air pollution to human health deterioration. Environmental auditing provides an opportunity to determine the source of environmental impacts and to evaluate possible corrective action as part of regulatory environmental compliance requirements or as part of a broader environmental management plan in an organization or project. • Mitigation & impact management (Environmental management plans (EMP). This programme will provide participants with a full and comprehensive understanding of environmental management practices related to mining life cycle activities. Environmental management of mining projects and operations involves all aspects of the activities from grass root and advanced exploration, feasibility study, development, exploitation to their closure and decommissioning phases. A project or an operation that does not have sound environmental management systems, will likely run into major problems that usually include financial losses for the owners and other stakeholders, legal challenges, negative social and environmental impacts. The Programme will be beneficial to project and site managers, advisors, regulators, safety and environmental professionals, engineers and operations staff involved in oversight or management of environmental and social issues all along the life cycle of mining projects. The programme will address all phases of mining life cycle from exploration and feasibility studies through planning and construction, operation and closure and will cover broader spectrum of environmental aspects ranging from air, water and waste management to biodiversity conservation. Statutory obligation for companies to comply with all applicable municipal, local, provincial, regional and federal legal requirements will be examined. The course has strong industry focus and uses local and international case studies to illustrate management approaches. Development activities such as business, industry and large development projects play a crucial role in the social and economic development of a country. These activities, however, can also be a major source of local, national and trans-boundary environmental damage with serious effects on the physical environment, biodiversity, climate and human health. The traditional approach to addressing environmental issues by developers has been reactive, ad-hoc and end-of-pipe manner. It is now well known that this approach is often times very costly to the local, national or regional economies. Uncontrolled economic development that depletes natural capital and generates serious pollution is not sustainable for either the present or future generations. Integrating environmental management into the design and implementation of development interventions can go a long way to mitigate the negative environmental effects and to enhance the environmental and socio-economic benefits. • Implement ISO-based environmental management systems in organizations and projects. • Environmental management systems (ISO 14001). Central & Local Government Officials involved in the formulation, planning and implementation of economy-wide policies, strategies, programmes, plans, and legislation. These include officials working in Government Ministries/Departments such as Environment, Natural resources, Economic Planning, Tourism, Mining, Energy, Infrastructure, Roads, Agriculture, Water, Defense, Local Government, parastatals and regulatory agencies. Officials in the environmental impact assessment (EIA) practice are eligible to attend the course. • Close negotiations with win-win agreements that last. • Implementation, monitoring and compliance of MEAs. • Describe institutional issues in climate change risk management. • Institutional issues in climate change risk assessment. Officers responsible for corporate social responsibility, corporate communication, public relations, marketing, environment, quality, occupational health & safety, from government ministries, departments, parastatals, & agencies. Participants from private sector companies and NGOs in the above-mentioned areas can also attend. • Appreciate the importance of the core social responsibility management subjects- organizational governance, human rights, labor practices, the environment, fair operating practices, consumer issues, and community involvement and development. • The GRI sustainability reporting guidelines. • Conduct an EMS audit based on the ISO 19011 standard. • Develop and implement an environmental management plan (EMP) complete with a mitigation and monitoring plan. • Mitigation and impact management (Environmental management plans (EMP). Public spending, which represents between 15% and 30% of GDP in a given country, can help drive markets towards innovation and sustainability, thereby enabling green growth and the transition to a Green Economy. Green Public Procurement (GPP) is one of the means to achieve sustainability. It has thus become increasingly clear among policy makers that public procurement can play a strategic role, and that, it can specifically contribute to achieving sustainable development goals. Through GPP, governments can lead by example and deliver key policy objectives in the environmental, social and economic fields through reduction in greenhouse gas emissions, improved energy and water efficiency and recycling. Associated positive social benefits include poverty reduction, improved equity and respect for core labor standards. And from an economic perspective, GPP can generate income, reduce costs and support the transfer of skills and technology. Participants will examine practical environmental practices and tools for Greening Public Procurement. • Set contract performance clauses which underline the environmental commitments made by suppliers or service. Currently China has over 3,000 active projects in Africa worth over US$100 billion, ranging from railways, roads, cities, power, oil and gas, mining, sea ports, to stadiums. The capacity by Africans to manage risks in these projects is to a greater extent still wanting and therefore it is a matter of urgency for Governments to build adequate capacity to manage risks in the growing number of projects currently underway on the continent. Applying the principles and guidelines from the Risk Management Standards (ISO 31000 and IEC 62198), this programme provides a clear introduction to basic project risk management, introduces participants in specialized areas of projects and procurement, and shows how quantitative risk analysis methods can be used in large construction projects. The project risk management process addressed in this programme is intended to result in the effective management of project risks and opportunities during the entire project life cycle from project inception to completion of construction. Officials (Planners, Engineers, Procurement officers, Project managers, financiers) from Central and Local Government, Parastatals, Infrastructure Regulatory Agencies, responsible for oversight, planning, implementation, monitoring and evaluating public sector projects. • Pro-actively respond to risks throughout the project cycle. • Risk communication and accountability. Solar energy is a good option for decentralized rural and urban energy supply. However, not all projects are successful. Reasons for failure might be technical, financial, institutional, economical, site-specific, social or even of a cultural nature. The aim of this course if to provide participants with an insight into the different aspects of solar energy. Aspects such as the potential, technologies, end-use applications, performance, restrictions, economic viability, conditions for successful application and dissemination, will be discussed. Have the ability to judge the viability of new solar energy projects, to set conditions for implementation, to make calculations for the size and costs of the system, and to advise potential customers such as farmers, individual households, and architects on solar energy systems. • Conditions for application of solar energy. Central & Local Government officials involved in formulation, planning and implementation of economy-wide policies, strategies, programmes, plans and legislation. These include officials working in Government ministries/departments such as environment, natural resources, economic planning, tourism, mining, energy, infrastructure, roads, agriculture, water, defense, local government, parastatals and regulatory agencies. Officials in the environmental impact assessment (EIA) practice are eligible to attend the course. • Document all this in SEA reports and through stakeholder consultation, implement, review & monitor progress. • SEA implementation, reporting, review and monitoring.